Kevin Barker, Owner of Barker Boatworks, with Dylan Dykens and Dylan's custom made tower for his Sea Hunt. Florida-based bay boatbuilder Kevin Barker makes wishes come true for customers and strangers alike. 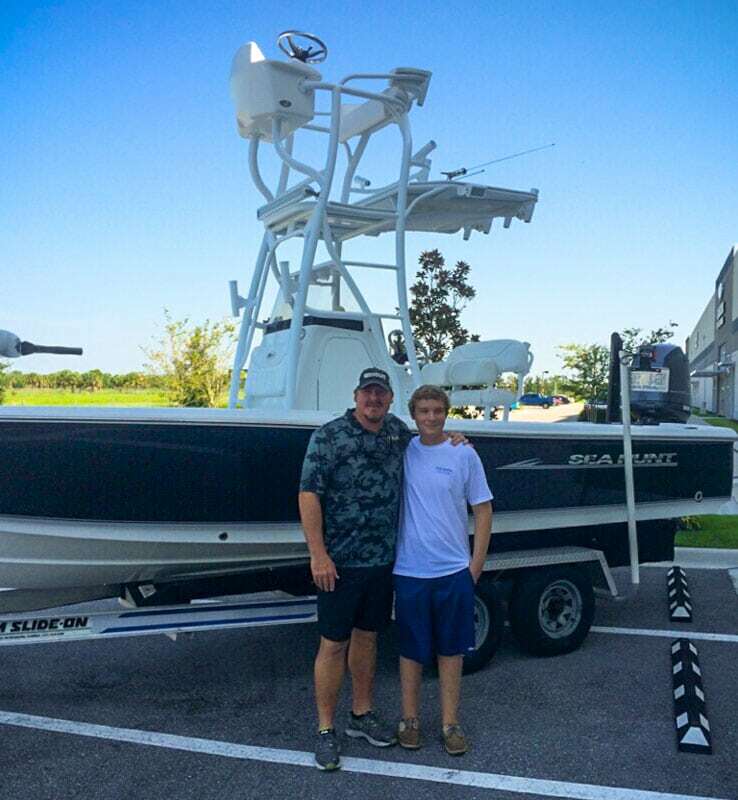 Barker recently teamed up with Make-A-Wish Foundation to supply 17-year-old Dylan Dykens with a custom tower for his 22′ Sea Hunt BX BR. Dykens, who was diagnosed with T-cell Acute Lymphocytic Leukemia in June 2014, is going through chemotherapy treatment at All Children’s Hospital in St. Petersburg, Florida. A boating and fishing enthusiast, Dykens will now be able to go fishing for redfish, snook and tarpon, as well as participate in fishing tournaments. Meet Kevin Barker. SB: Tell us a bit about yourself. KB: I was born in Savannah, Georgia, and grew up on Hilton Head Island just north of Savannah in South Carolina. Barker Boatworks’ first model was named the 26 “Calibogue Bay” because my earliest fishing memory was with my grandfather in Calibogue Cay just west of Hilton Head Island. My first boat was a Boston Whaler when I was 13. My 14-year-old son and I just finished completely renovating his first boat, a 15′ Boston Whaler. I attended Syracuse University on a football scholarship where I played for five years. SB: Tell us about your involvement with the Make-A-Wish-Foundation and Dylan Dykens. How did it come about? What inspired you to act? KB: A family friend who is on the Sarasota board of the Make-A-Wish Foundation contacted us about Dylan’s wish. As parents all we want is to keep our kids healthy, safe and do all we can to raise them into becoming good men and women. I can’t imagine what the Dykens went through and are still going through with Dylan. When we were asked to help, I didn’t think twice. To be able to help put a smile on his face was the reason we did it. SB: What was the process for creating the custom tower and Dylan’s involvement? KB: When I met Dylan and his dad, Doug, for the first time I knew very quickly that Dylan had a specific design he wanted. During the next couple of meetings he even put together a book with all of the lights, rod holders, footrests, and hardtops he wanted to incorporate in the tower design. He would come to the shop once or twice a week in between treatments to oversee the progress. He even helped out when he could. All I wanted was to build exactly what he wanted, and I think we accomplished that. SB: How did you get into the boating industry? KB: I have always had a passion for boating and fishing. In the mid 90s I fished in an average of 15 kingfish tournaments every year in 34 and 36 Yellowfins. I was hired by Yellowfin Yachts to run the inshore division, which I did for 10 years. Until now it was my first and only job in the marine industry. SB: Tell us about your company. KB: Our company builds the most innovative bay boat in the industry. We took all the features that customers asks for and incorporated them into the design of our first boat, a 26′ bay boat. We designed the boat to have more offshore capability. We did this by building a boat that has more beam than your typical bay boat and by increasing the freeboard and adding some “Carolina” flair to allow the boat to be much drier than the competition. We designed a console to be able to accept large MFDs (up to 19″) and be completely finished on the inside to be able to accommodate a marine head. We go the extra mile to produce a boat with “yacht quality” fit and finish. SB: How has your company developed and changed over the years? SB: What do you love most about what you do? KB: I get up every day and talk about our company, boating and fishing. To be able to get up and be excited about getting to work is something not too many people can claim. There is no dollar amount you can put on that. I truly enjoy dealing with the customers. They all have a different view on how they will use their boat. Every customer has different ideas on options, some of which we’ve even adopted and named after them. SB: What type of boating/fishing do you enjoy personally? KB: I enjoy boating with my family most, going to our local sandbars and islands, setting up camp, and just hanging for the day. My wife will tell you I sometimes go a little overboard bringing tents, a grill and all the beach toys you would ever need. I love cooking out on the beach after a fun day relaxing with family and friends. Now that our kids are getting older, my wife (Sarah) and I also enjoy going out for dinner on the boat as well. On the fishing side, I still enjoy tournament fishing and try to include my 14-year-old son as much as I can. We recently fished in a couple of kingfish tournaments on the east coast and had a blast. My two daughters also like to fish, so you can call us a fishing family. SB: Have you been on the water with Dylan? KB: I have not been out on the water with Dylan yet, but we plan to, soon. I was recently at a party in St. Petersburg, and when he and his family idled up in the boat I cried like a baby! SB: If there’s anything you’d like to add, please feel free.